“Tie him up and throw him into Bay of Bengal”. This was the advice given by close relations to me, Lakshmamma, Siddappa’s mother. Yes, such foolishness was bound up in the hearts of my relatives! My son Siddappa turned into a burden to all of us when we used to beg from door to door for our livelihood. He started growing physically but lacking behind in everything else. There was considerable delay in the milestones of his development so I approached medical doctors at a Govt. Hospital where I was shocked to learn about his condition. It felt like I was forcibly thrown from the peak of a mountain into a valley. I realized that I could not take care of him in view of our poverty. I am not educated and did not know how to handle him. I was told that he was a child with special needs and need to be paid personal attention. How was it possible? Who could help me in this confused and helpless situation? With these questions I slowly became locked into a bleak place within myself. I could not find a way out. I even slowed down my profession of begging and spent more time with my son which caused problems for my other family members. I firmly rejected their advice to let him die. We belong to the ‘PAGATI VESHAGALLU’ community. Ours is a very old, traditional way of life. For countless generations we have lived on a form of begging in groups, going from door to door depicting ourselves as characters of God related to Indian mythology such as Lord Rama, Krishna, Hanuman, Shiva & Parvathi. This is our tradition, based on a divine belief. We receive used clothes, rice and other things necessary for living from people in appreciation of our appearance. Day time (PAGALU) is our choice for begging with makeup (VESHAM) and hence we are called ‘PAGATI VESHAGALLU’. So I could continue my only way to secure an income, I left my five year old son Siddappa at Lebenshilfe, placing him at the feet of its Founder Saraswathi Devi. I left him with no knots tightened to either his hands nor legs. Her acceptance of Siddappa for admission showed me a way forward. Training at Lebenshilfe empowered both me and my son and strengthened us to face the challenges of our lives. As a result today Siddappa, my son has been developed to full potential. Lebenshilfe trained him for the real world and even success, instilling moral values, molding his behavior to fit into the community. Now he walks even taller than the people who once criticized him. He talks, sings and plays musical instruments better than those who advised me to put him to death. 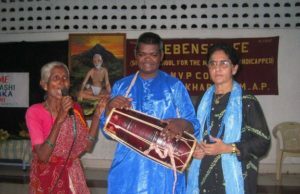 He earns pocket money by playing DOLAK and TABLA (the Indian traditional drums), participating in music concerts in public places during local deity festivals and receiving recognition and acceptance as a worthy human being. Now girls from our own community are offering themselves for marriage. In the near future I am quite confident that he will walk into the society with his wife to lead a normal life like anybody else. What does Lebenshilfe mean to me, to all of us? Lebenshilfe gave my son a life with meaning, a life with respect, a life with dignity and a life that offers him a place in society. That is why, for us, Lebenshilfe is a TEMPLE and its founder a ‘GODDESS’.